Spokane (Pronounced: spoh-KAN) is a city in the U.S. state of Washington. 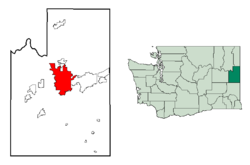 Spokane is in the eastern half of the state, about 20 miles (30 km) from Idaho. Spokane is 92 miles (148 km) south of Canada. Spokane is the second largest city in Washington, while Seattle is the largest. Spokane's nickname is the "Lilac City". The population of the city is 199,630 and the population of the metro area of Spokane is 435,644. Spokane was founded in 1871 when a sawmill was built on the Spokane Falls. In 1889 a fire burned down the downtown area of Spokane. In 1892 the railroad came to Spokane, and this made it easier for people to get into and out of the city. In 1974 Spokane hosted the World's Fair. This brought a lot of people and business into Spokane. The Spokane River flows through the city. In downtown Spokane, there is a large waterfall called the Spokane Falls. The first buildings in Spokane were built near the falls. The Spokane River has many dams that make energy for the people of Spokane. In the Summer, Spokane is hot and dry. Spokane has cold and snowy Winters. Spring and Fall are very short. Temperatures over 100 °F (38 °C) or less than −10 °F (−23 °C) do not usually happen in Spokane. However, the hottest temperature in Spokane was 108 °F (42 °C), and the coldest was −30 °F (−34 °C). Wikimedia Commons has media related to Spokane, Washington. ↑ "Definition of SPOKANE". www.merriam-webster.com. Retrieved 2018-04-16. ↑ "Monthly Average/Record Temperatures". weather.com. Retrieved 8 August 2015. This page was last changed on 9 August 2018, at 10:12.